A collection of more than 120 recipes formulated to optimize brain health, boost memory, improve mood, sharpen the central nervous system, and more. Depression, ADHD, memory loss, agitation: These may seem like inevitable byproducts of modern lives spent multitasking, not getting enough sleep, and operating on digital overload. But while much of the brain's work still remains a mystery, a growing body of scientific evidence suggests that the food you eat directly affects how well your brain functions. Brain health also plays a significant role in staving off diabetes, heart disease, and Alzheimer's disease. 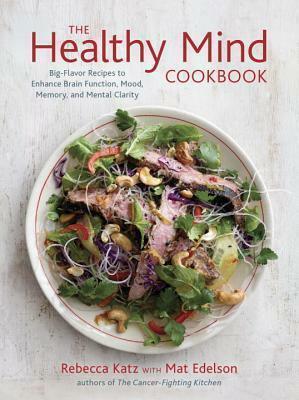 In The Healthy Mind Cookbook, Rebecca Katz has harnessed the latest research on the brain to identify the foods that can improve the brain's ability to control cognition, emotion, and physical function--all of which dictate memory and mood. She then translates the very best of brain science into the kitchen, using delicious nutrient-dense foods as a tool for promoting a healthy mind from childhood through the golden years. With a culinary pharmacy listing the benefits of key ingredients, complete nutritional details for each dish, and flavor-packed recipes for every meal of the day, including Avocado and Citrus Salad, Sweet Potato Hash, Turkish Lamb Sliders, and Chocolate Cherry Walnut Truffles, The Healthy Mind Cookbook will help lift the fog of everyday life so you can reach your full physical and mental potential. And Now a Word from Our Second Brain . . .
"Rebecca Katz . . . has now focused her science-based culinary skills on optimizing brain function and mental wellness. Her recipes in The Healthy Mind Cookbook are easy, yummy, and consistent with cutting-edge research on the influence of dietary choices on the brain and mind." "Buy this book to make your brain healthier and happier--gorgeous, informative, and smart, Rebecca Katz delivers another gem!" "This is a beautiful and informed book that shows us how food not only brings utter delight to the table, but also keeps our minds and bodies truly nourished." --Jennifer McGruther, author of The Nourished Kitchen "Rebecca Katz brings joy and good humor to healthy eating with recipes that are gorgeous, creative, and accessible. The Healthy Mind Cookbook provides a delightful link between the foods that we know are good for us and the wisdom behind it." REBECCA KATZ, MS, is an accomplished chef and national speaker who has worked with the country's top wellness professionals and taught patients and doctors at leading cancer centers about the powerful role of food in cancer care. She is the former senior chef and nutrition educator at Commonweal's Cancer Help Program, executive chef emeritus for the renowned Food as Medicine professional training in medical nutrition therapy, and co-founder of Healing Kitchens, a company that helps people translate nutrition and culinary science to the everyday plate through online and live courses, including The Cancer-Fighting Kitchen Course. She also consults for Dr. Andrew Weil's Arizona Center for Integrative Medicine premiere nutrition conference for health professionals, and is the author of Clean Soups, The Healthy Mind Cookbook, The Longevity Kitchen, and One Bite at a Time. She has been featured in the Washington Post, The Atlantic, on Oprah.com, and on National Public Radio, among other national media. She lives in the San Francisco Bay Area with her husband and two loyal kitchen dogs, Lola and Blossom. Visit rebeccakatz.com for more information. MAT EDELSON is an award-winning science, health, and sports writer. He is the former anchor/director of the Johns Hopkins Health Newsfeed, a nationally syndicated daily radio program. He lives in Washington, DC.